I went to New York City last month for Fashion Week. It was probably one of my top 3 most “pinch me” worthy moments in my life. I had the BEST time and I hope to go back season after season. While my friend Simone and I were there we basically planned everything around food, lol. My macro-counting flew out the door and I chowed down. Hard. If you are taking a trip, here’s where we choose to eat during our 3-day-long stay. This tiny Mexican place is a Michelin-Starred restaurant with the best Margaritas I’ve ever had. We stumbled onto it because it was within walking distance of the Broadway theater where we were seeing Chicago. We were SO lucky because it was delicious. I had tacos and street corn and I could’ve died happy after that meal. The best. brunch. ever. We ate here after a class at Soul Cycle in NoHo and it was spot-on. I had a healthy breakfast bowl with quinoa, tons of greens, chicken and a poached egg. It was nice to feel like I made a good decision after stuffing myself with all the worst things all weekend. Did someone say burgers!? This cute place was walking distance from our hotel and was the perfect easy stop for a classic burger and fries. It was so satisfying. For some reason I never end up ordering burgers, I always go with chicken, so this reallllly did it for me. Loved it! Honestly, I have never felt so fancy in my life. This place is beyond cool and is a MUST if you visit the city. You enter the restaurant through an antique jewelry store and the vibe is just too cool. The entire place is dimly lit and edgy. It was Restaurant Week so we were able to get a 3-course meal for just $50 and I was in heaven. We had the most scrumptious donuts with 3 different dipping sauces for dessert. Oooo and did I mention the chef was on Chopped!? I wish that I could bring this place back to Greenville! I am all about a good lunch bowl and Ruby’s Café surely delivered. I had the Crispy Grain Bowl and I have been trying to recreate it at home ever since, to no avail, ugh. Definitely swing by if you are in the SoHo area during your stay! This place is the perfect quick lunch spot if you are shopping in SoHo. They serve all kinds of baked mac and cheese, so you can imagine my joy. 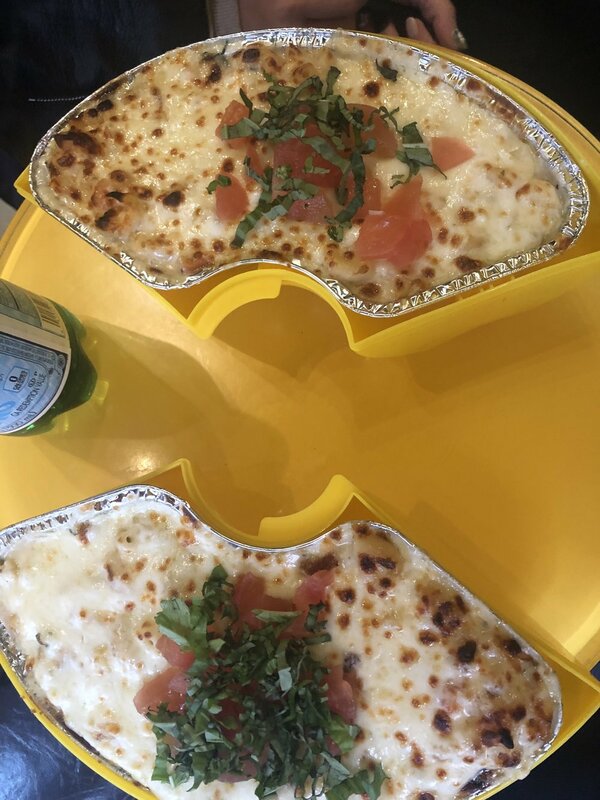 I got the margherita mac and it raised the bar for all mac and cheese past and future. They have the cutest little to-go containers that look like noodles, so we had plenty to snack on when we got home. This authentic Chinese restaurant is in the heart of China Town. It was probably our only meal that was under $15 and they gave us SO MUCH FOOD. The Chicken Lo Mein was to-die-for and I can never look at a Chinese buffet the same way again. My sister and brother-in-law lived in NYC for several years and this under-the-radar restaurant was one of their must-eat suggestions. And it’s no surprise that they were right. Give me all the carbs. Eataly is not just a restaurant, it is an experience. There are pizza, salad and pasta stations and that is just scratching the surface. They have all kinds of authentic Italian ingredients and treats that you can purchase and take home if you want to try to recreate anything yourself. My pizza was amazing and was the perfect way to end out afternoon spent shopping at the Oculus. This is right near Ground Zero so be sure to check that out and pay respects while you are in the area. It is gut-wrenching but so important to see! I’m pretty sure you can’t go wrong when you eat in New York City. There are a million and one options and each one is more interesting and delicious than the last. Do you have suggestions? Send them my way so that I can share them with everyone!